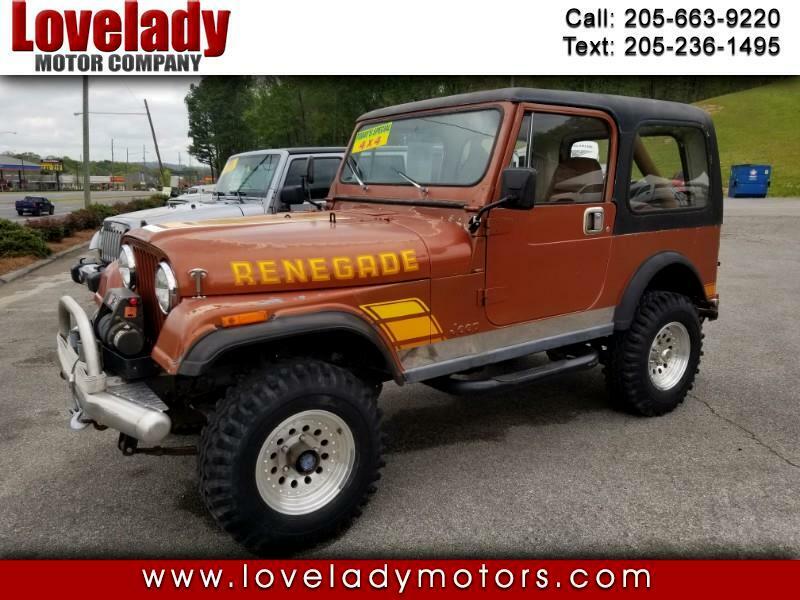 Used 1983 AMC CJ7 Base for Sale in Pelham AL 35124 Lovelady Motor Company, Inc.
Up for sale is a nice little 1983 Jeep CJ7 Renegade. It has the 4.2L inline 6 engine mated to a 5 speed manual transmission. The engine runs good and the transmission provides smooth shifts. The Jeep drives well down the road like you would expect from a 30+ year old Jeep. The Jeep also comes equipped with a hard top. The front off road bumper is nice and sturdy and has a Warn winch mounted to it. The Jeep does have some rust but nothing that you would not expect from a Jeep of this age. The paint is faded but appears to be original. Contact Stephen or Keith today for more information! Message: Thought you might be interested in this 1983 AMC CJ7.